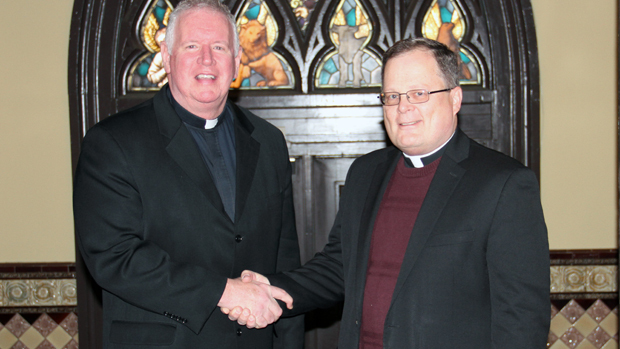 Jesuit Father James Fleming (left), president of Wheeling Jesuit University, greets Roman Catholic High School President Father Joseph Bongard. Wheeling Jesuit University in West Virginia has begun offering a new scholarship begun last year to students of Roman Catholic High School in Philadelphia, it was announced Jan. 6. The Bishop Bransfield Scholarship is named for Philadelphia native Bishop Michael J. Bransfield of the Wheeling-Charleston Diocese, who is a graduate of Roman Catholic. The scholarship is awarded to students from the seven West Virginia Catholic high schools, in addition to Roman Catholic in Philadelphia. Students who attend the university can receive $2,000 each from the scholarship, as well as an additional $4,000 scholarship if they graduated from any Catholic high school in the United States. Both scholarships are renewable for four years if the student maintains the applicable academic requirements. “Bishop Bransfield has long demonstrated his dedication to Catholic education — and this is one additional way in which he is working to make a Wheeling Jesuit education accessible and affordable to a greater number of students,” said Wheeling Jesuit University President, Jesuit Father James Fleming. Bishop Bransfield said he was grateful for the expansion of the scholarship to Roman Catholic and he thanked Father Fleming for the decision, “which will make a positive impact on deserving students who wish to study at our only Catholic university in the diocese,” the bishop said. For more information on scholarship opportunities or to apply at Wheeling Jesuit University, call 800-642-6992 or visit wju.edu.